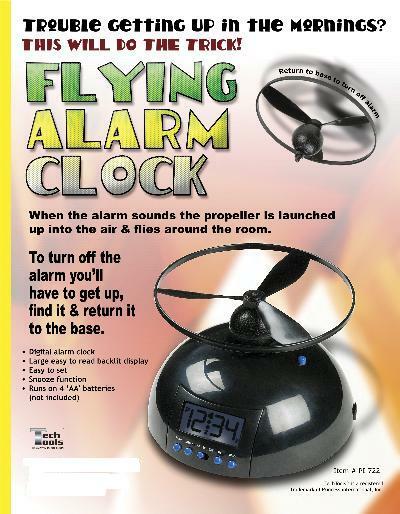 Flying Alarm Clock [Flying Alarm Clock PI-722] - $14.95 : NewDaVincis.com!, Great Innovative Products, Gadgets and more. Trouble getting up in the mornings? This will do the trick! When the alarm sounds the propeller is launched up into the air & flies around the room. To turn off the alarm you?ll have to get up, find it & return it to the base. For larger quantities please contact info@NewDaVincis.com?.